Civil Coping Mechanisms, 9781937865740, 196pp. The stories in Transitory consist of familiar locations turned bizarre and longstanding relationships sacrificed to singular obsessions. Unearthly figures appear on a city street, the crew of a vessel in the North Atlantic see disquieting visions in the sky, and students become fixated on a film with mysterious origins. Tobias Carroll introduces us to a perspective of the world as uncanny as it is erudite, as revealing as it is hidden, where the absurd is often the most preferable of outcomes. 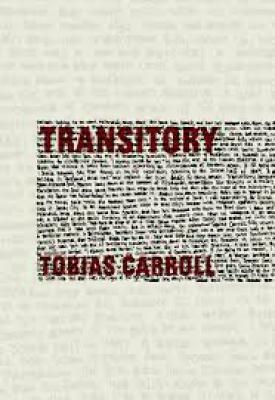 Tobias Carroll is the author of the short story collection Transitory (Civil Coping Mechanisms, August 15, 2016) and the novel Reel (Rare Bird, October 11, 2016). He is the managing editor of Vol.1 Brooklyn. His writing has been published by Bookforum, Tin House, Rolling Stone, Hazlitt, Men’s Journal, and more. He grew up in Tinton Falls, NJ and now calls Brooklyn, NY home.